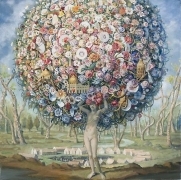 Mark Moore Gallery is pleased to announce new paintings from acclaimed artist Julie Heffernan. Heffernan's theatrical and opulent canvases are a hybrid of genres, encompassing portraiture, surrealism and still life, amongst others; yet their Old Master quality goes beyond simple irony or quotation. The initial impact of Heffernan's "self-portraits" recedes to allow the artist's skill in her technique and the allure of the paintings' beauty to emerge and entrance the viewer. 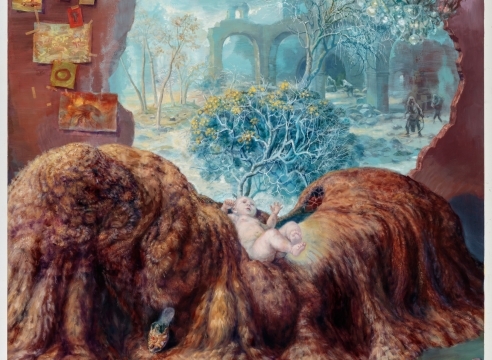 Her works act as unexplained allegories of the imagination and indulgent guilty pleasures. Although Heffernan has refined the same subject matter for the better part of 15 years, her works feel particularly poignant today; their slightly ominous tone acting to forewarn, the sumptuous canvases both a talisman and a critique of brazen conspicuous consumption. "The female subject, despite being nearly engulfed by the teeming riches cascading from her waist or piled on her head, is always straight backed and serene. Looking out from her lavish tableau she seems blithely unconcerned about the corpses at her feet." 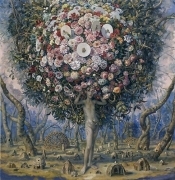 Julie Heffernan received her BFA from the University of California (Santa Cruz, CA) before going on to complete her MFA in painting at the Yale School of Art (New Haven, CT). Her work has been exhibited internationally and she has had major solo shows from coast to coast in the United States. She has been awarded numerous grants and her work is included in the collections of the Virginia Museum of Fine Art (Richmond, VA), The Progressive Corporation and The Mint Museum (Charlotte, NC), to name a few. Heffernan has been reviewed in publications such as Artforum, Modern Painters, and the New York Times. She lives and works in New York, NY. This will be her inaugural exhibition at the Mark Moore Gallery.